Chippewa Nature Center’s natural resources are its main interpretive feature for visitors and are maintained and improved for the purpose of interpreting the natural environment and the relationship people have to it. i.e. With vigorous activity or production, diverse and numerous interactions between system components, and resilience, which is the system’s capacity to maintain structure and function in the presence of stress. i.e. With minimal appearances of human structures. Considerable effort will be required to exclude numerous exotic species. Diversity of ecosystems is an important consideration to the management plan that may require restoration efforts or maintenance activities to provide examples of historically native ecosystems. During the fall of 2005 three wetland spillways were replaced with new water control structures that are more aesthetically pleasing and will give CNC more flexibility to manage these wetlands in the future. This project also included removing large slabs of concrete that were along the Burgoon drain and throughout the Wetlands Area. 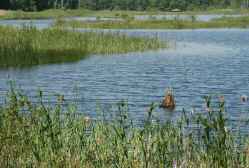 During the spring of 2006 in cooperation with Ducks Unlimited, the United States Fish and Wildlife Service and the Natural Resource Conservation Service, the approximately 20 acres of fields in-between the marshes at the Wetlands was replanted with native warm season grasses, such as big and little bluestem, Indian grass and a wide variety of native wildflowers. The goal of this project is to replace this field area that had mostly exotic species of plants with species that were likely to be found in Midland County before major human disturbance. This field area will then be maintained by occasional mowing and pre-scribed burns as an open area that animal species requiring larger areas of grasslands can utilize. Control of invasive exotics is important to restore healthy native plant communities. CNC began major efforts to control autumn olive in 1987. Since that time large amounts of money and time has been spent on autumn olive control. Even with all the effort, autumn olive is still abundant at CNC and many new invasive species have moved in and taken over areas of native plants. Currently CNC is focusing most of its effort on approximately a dozen invasive exotic plant species, especially in areas that are not heavily infested yet, areas that are becoming monocultures of a certain species and in areas where they are crowding out trails. If You Want to Help with Land Management there are often many projects that need to be accomplished that can be done by volunteers. If you are interested in helping with Land management projects, contact Tom Lenon at tlenon@chippewanaturecenter.org or 989.631.0830. Chippewa Nature Center covers 1200 acres in southeastern Midland County, which can be explored on over 19 miles of trails, including a 3.5-mile paved biking trail from Midland’s Tridge (all other trails are for foot travel only). Because the Center seeks to give visitors a natural experience, pets and smoking are prohibited on all its lands. Trails are open 365 days a year from dawn to dark, with some grooming for cross-country skiing. 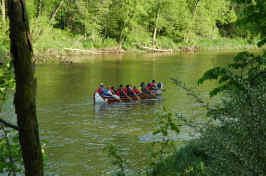 At the heart of the Center lies the confluence of the Pine and Chippewa Rivers, home to Native Americans for at least several thousand years. It’s now a 3-mile canoe ride from Midland’s Tridge, and still home to many mink. (To help protect the riverbanks, fishing is prohibited.) Cutting through the Saginaw Valley, these rivers drain the flat, former lakebed of Lake Huron. Forests along the rivers attracted loggers in the late-19th and early-20th Centuries. Today, upland hardwoods may be dominated by sugar maple (from which we make maple syrup each March), American beech and ash, or by oak, pine and aspen, with pockets of eastern hemlock. Trilliums and orchids in this ecosystem are recovering from earlier intensive livestock grazing, and from a white-tailed deer herd numbering about 100 per square mile in the 1980s. Today, our goal to recreate samples of pre-logged forest is hampered by the invasion of such exotic plants as buckthorn, autumn olive, and garlic mustard. Home to nesting barred owls, wooded floodplains contain silver maple, elm, hackberry and a few sycamores at the northern edge of their range. Swamps may be dominated by speckled alder, or by oaks and red maples, which provide homes for an increasing gray squirrel population, as well as blue-winged warblers. The Center’s upland fields were manipulated in the first half of the 20th Century by farmers planting crops and raising livestock; eastern bluebirds now enjoy them. Open wet areas include cattail marshes, and a small boggy wetland with Sphagnum moss perched on peat over a sand and clay base. Humans created all of the major ponds, including one over 10 acres. The Oxbow is a natural exception; it was once part of the Chippewa River until the flowing water bypassed the looping curve a century ago.